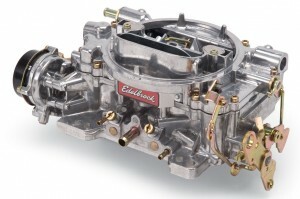 Whenever I think of 4-barrel carburetors, Edelbrock is always top of mind. It’s no surprise, because Edelbrock has been leading the automotive performance parts industry since 1938. It all started when Vic Edelbrock designed the “Slingshot” aluminum intake manifold for his 1932 Ford Roadster. Today, they are known for producing not only intake manifolds but also carburetors that provide great performance and exceptional fuel economy. You can expect this same performance from the Edelbrock 1406 Performer Carburetor. It features an electric choke and boasts an output of 600 cubic feet per minute (CFM). Another reason I like this carburetor is because you can drive with confidence knowing that your carb will stand up to heat and warping. It’s constructed with high-quality aluminum to withstand whatever you throw at it. When you demand performance, you can count on this carburetor. It has no plastic parts or power valves like other popular carburetors. While this can be a great “set-it-and-forget-it” carburetor, many gearheads like it because it has custom tuning abilities. This carb has two-step metering rods that can be changed without disassembling the carb, making it easy to install. I should also note that the wide selection of rods can help you find the perfect tuneup for your engine. Is the Edelbrock 1406 right for you? I am a big fan of this carb but there are other great options. If you’re still on the fence I recommend comparing it to the Holley 0-80457S Model 4160 Street Performance 600 CFM Square Flange 4-Barrel Carburetor.